At Mobile World Congress 2019, The Chinese giant Oppo had revealed a Smartphone with 5G Technology and 10X lossless Zoom. The Smartphone is supposed to be Oppo Reno with some minor changes. 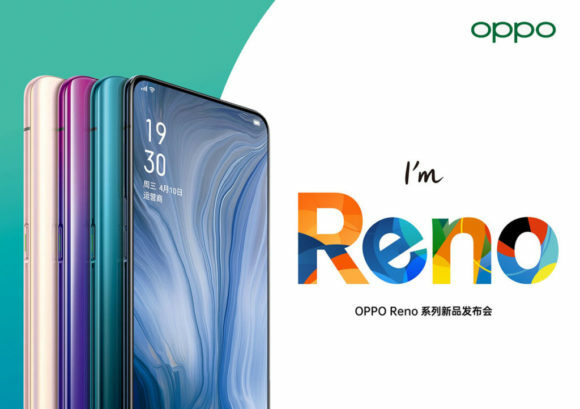 We have already seen it in several leaks & Renders around the web and The Launch of Oppo Reno is expected for next week in China. The Company had already sent out Press invites for a Global launch event in Zurich, Switzerland on April 24. The Phone will feature 10X Lossless Zoom Technology in Primary Camera with a 16MP “shark fin” pop-up Selfie camera. The Primary Camera will be a Triple camera setup including Sony IMX586 48MP main camera combined with an 8MP 120-degree super wide-angle lens and a 13-megapixel telephoto lens. However the Camera configuration is yet to be confirmed. According to Previous leaks The Smartphone may sport Snapdragon 855 SoC with up to 8GB RAM & 256GB internal storage. Coming to the Display it could feature a Full HD+ 6.6-inch AMOLED or OLED Screen. The Software will be ColorOS 6 based Android 9 Pie. Some reports also say there will be a 50W fast charging support for the 4,000 mAh battery in Oppo Reno. In the upcoming launch event the company could also bring Lite version of Oppo Reno with Snapdragon 710 SoC. Both phones will definitely support 5G, Comment below and Stay tuned with Alloftop for more updates.